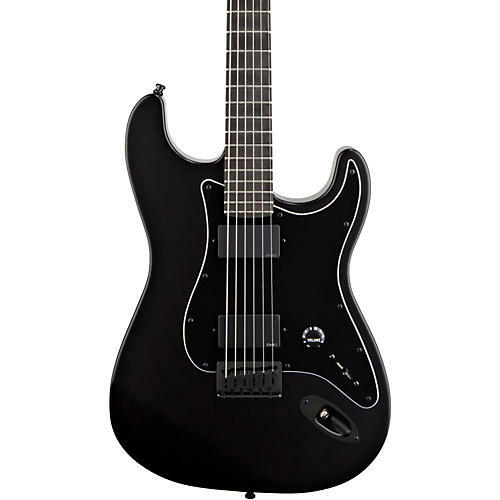 The Fender Jim Root Stratocaster electric guitar is as unique as Slipknot's guitar maestro himself. Featuring a black mahogany body and a 25-1/2" scale maple neck with a thin "C" shape and an oversized headstock fitted with Fender Deluxe cast/sealed locking tuning machines. A smooth ebony fretboard sports 22 jumbo frets and a 12" to 16" compound radius that promotes super fast shredding. The Fender Jim Root guitar has an EMG-60 active humbucker (neck) and EMG-81 active humbucker (bridge) that let your solos roar through the crowd. A 6-saddle strings-through-body hardtail bridge adds even more sustain to the Fender Stratocaster sound. Includes a hardshell guitar case.